DON'T FORGET TO UPDATE TAX CODES AND DEDUCT UNPAID LEAVE. WHAT ELSE SHOULD YOU DO? Not quite sure what steps to follow when you run payroll? Are you worried that you might be missing a step and not calculating staff wages correctly? Keep forgetting to check for tax code updates? Do you forget to add overtime and deduct absence. Don't forget - your RTI must be submitted BEFORE you pay staff. Our 10 minute checklist will walk you through the payroll process so you can be confident in your calculations. 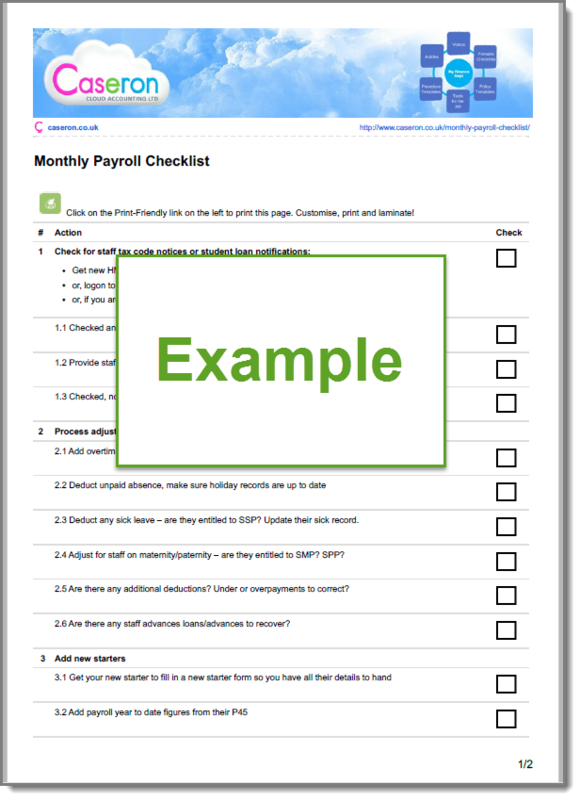 > Customise, print and laminate your checklist for use again next time you process payroll. Lisa is a qualified accountant fascinated (nay, obsessed!) by all things cloud and tech related. She is on a mission to find really useful systems, processes and tools that the small business owner can learn easily and implement quickly to manage their business finances and drive their business forward. Happily married for 19+ years to Paul, and mum to two fabulous, slightly crazy teenage children. Lisa has heard much about the work-life balance myth and like many of the people who she comes into contact with daily - hasn't quite got the balance right yet! Founder of Caseron Cloud Accounting in 2011 - Paul and Lisa have developed a fabulous team with Harry and Tom and a wonderfully varied and dynamic portfolio of clients. "Helping our clients run their businesses has provided the material for our online courses. We are eternally grateful to them and we are nagging, cajoling and encouraging them to get their own stuff online and join in this journey where we want to start sharing our knowledge outside our accounting client base."